Football Season! Let the Irrationality Begin! Twelve years ago, as I was teaching English as a Second Language (ESL) to middle-schoolers, two boys—a Venezuelan and a Mexican—entered my classroom furious at each other. Before reaching their desks, they had squared off, only inches apart—fists clenched, eyes bulging, mouths shooting bullets of Spanish. Holy Mother of God! These foreign boys were already sucked into the South’s most avid religion—football. But they’d somehow landed in two separate sects of that religion, like Shiites and Sunnis in the Fertile Crescent. 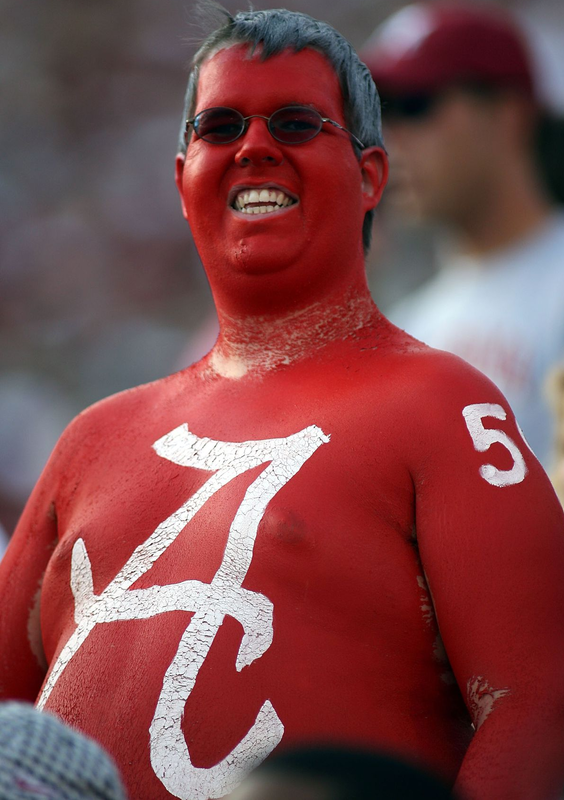 After all, isn’t this what Alabama v. Auburn is—a heated sectarian dispute? Have you found a church home? Are you for Alabama or Auburn? Answering either in the negative will bring public shaming. My two students had covered their bases. They had found a church home. In fact, they had found the same church home. But, as is often the case in the same church, they had become adherents of different theologies. And so they Hatfield-and-McCoy-ed it all the way through that football season, the end of which featured Auburn beating Alabama, 22-15, serving only to flame the feud into the following season. What is it about football fandom—or, really, fandom in any competitive sport—that so stokes up the passions? Why does it become so severe? Wouldn’t it be more understandable if those who were about to fight were actually participating in the game? After all, if the outcome of the game depends on YOU and what YOU do, then your ego, your being, is clearly invested. If you win the game, you can rightly claim that in at least one respect, you are superior to your opponent. Those on the field (the court, the pitch, etc.) have an obvious ego investment: they’re actually doing the stuff that we call the game. But those in the stands (or watching on TV) are doing absolutely nothing (aside from feeding their faces and guzzling their beer). As do-nothings, how do they become so ego-invested in a game’s outcome? How do they arrive at the idea that, by virtue of kids in blue jerseys defeating kids in white ones, they have proven themselves somehow superior—when they did NOTHING? Sadly, there may be truth in that, because, even as I recognize the irrationality of fandom, I still participate in it. I still feel the personal repercussions of my team’s winning or losing. For example, this year if snow were to fall on the Sahara and the Pope were to twerk with Mylie Cyrus and Tennessee were to beat Alabama, I would find it impossible not to gloat over Bama fans (as they have over me since I can’t remember when). Why is this impulse to gloat so stubborn, so hard to subdue? I think Charles Darwin gave us the answer. Darwin’s evolutionary theory reveals that every living species has survived not so much by being rational as by being competitive, by kicking and clawing to stay alive. You and I are the progeny of winners, of primordial ancestors who—faced with fourth and goal and six seconds on the clock—battled their way into the end zone to put their genes in the next generation. We’re talking Super Bowl of survival here. Single elimination. Do you know that 99 percent of all species that ever existed are now extinct? That makes us the one percent—the descendants of those who were best equipped to scrap and fight, and lucky enough to survive. And this means that the impulse to compete is baked into our DNA—literally. So what does this mean for our crazy, irrational football fandom down here in the sectarian South? I think it means we’re drawn into these rivaling sports tribes not merely by choice. Sure, we do choose to be a Bammer, a Barner, a Vol, or whichever. But for millions of us, the impulse to become a fan is rooted to our genes. There’s something deeper going on, something more visceral than a conscious decision. A sort of genetic GPS steers us to attach ourselves to a tribe, to celebrate ritually with our fellow tribespeople, and to battle other tribes. Fandom lets it get out. And the good news is that being a fan lets us compete vicariously. We don’t have to hit or tackle or draw blood (though some of us fans—especially the drunker ones—sometimes do). Instead, we have our warriors (players) down there on the field (or court, or pitch) doing our bidding, clashing in our name while we chant and cheer, and shout and curse to spirit them on, despite the fact that we have not one ounce of influence on what they do down there.